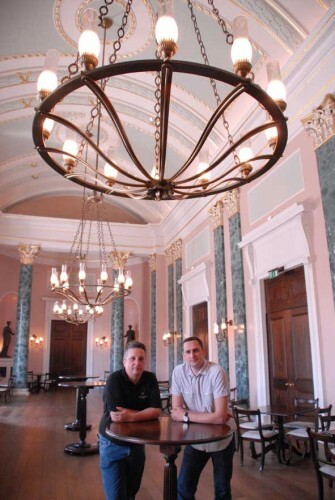 Stage Electrics has taken the lead as systems integrator, supplying a full architectural LED lighting solution into Theatre Royal, Drury Lane which stands proudly on the oldest theatre site in London. First built in 1812 in the heart of London’s West End and originally known as "Drury Lane", the theatre has recently completed a £4 million restoration. In collaboration with architectural lighting designer Norman Bragg and Theatre Royal’s Steve McAndrew, Stage Electrics’ worked hand in hand to find the right lighting solutions for this iconic venue. Control of all lighting is via Zero 88 Chilli dimmer racks with a Stick KE1 touch screen control interface and DMX was distributed around the space via Swisson DMX merger and splitter units. Business development manager Paul Roughton commented: "The scope of the project was to provide discreet lighting solutions for all the public areas inside this impressive location. The work is a faithful recreation of the original regency style art décor, including The Rotunda, both the King and Prince’s royal staircases and the Grand Saloon Bar. The style of lighting chosen was very specific, to keep the feel and look as theatrical as possible." "Originally only lighting units that produced white were specified but we proposed units with a pallet of coloured light giving more versatility and flexibility. The ability to change colours was embraced - currently the Grand Saloon Bar can be lit in any colour! An additional number of Philips Auerols on hidden track mount and ceiling roses were installed to accentuate the features of the foyer and the King and Princes grand staircases," Paul continued. Selections of Rosco LED Miro Cubes were deployed because of their compact size and high light output. Mounted above the doorway leading into the Grand Saloon Bar they were positioned to accentuate the gold motif in the ceiling top. "Working with Stage Electrics on this project made the process so enjoyable. Paul and his team came up with a lot of great solutions to achieve Norman’s creative design. We felt very safe in their hands; the end result was very high quality and to a high standard. We are very pleased with our refreshed venue," said Steve.